Joseph Hawkins, MPA ‘89, and his daughter Joselynn Hawkins Fountain, MPP ‘10 and PhD ’16, celebrate Joselynn's induction to the Pi Alpha Alpha honor society. For Joseph Hawkins, MPA ‘89, and his daughter Joselynn Hawkins Fountain, MPP ‘10 and PhD ’16, public policy and public administration runs in the family. Joseph pursued his MPA at GW as part of his appointment to the National Defense University’s program in executive leadership. He enjoyed the experience, calling the courses offered and professors he met the highlight of his time at the National Defense University. “The insights I learned while studying in the GW MPA program contributed significantly to my ascending to Senior Executive status in the Federal Government,” he said. He is fully retired now, but Joseph served as deputy associate administrator for commercial space transportation at the Federal Aviation Administration and as deputy assistant administrator for analysis at the Transportation Security Administration. “Public policy and administration knowledge and skills provide a solid foundation for anyone who is attracted to a career that requires competency in leading others, analyzing dynamics associated with public sector and non-profit initiatives and endeavors, and a working understanding of economics that come into play,” he said. 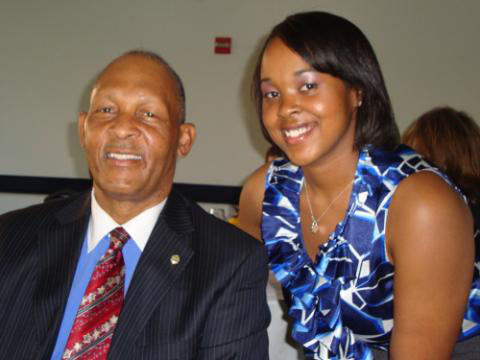 Over the years, Joselynn paid attention to her father’s work ethic. “I admire how much my father has been able to accomplish in his personal and professional life and how he leads by example,” she said. She eventually decided to follow his example. Joselynn completed her MPP in 2010 and currently is finishing her dissertation for her PhD. Joselynn is glad she followed in her father’s footsteps. As she plans for graduation, Joselynn hopes to be an adjunct professor at a local university in addition to her work in the federal government. She currently serves as a senior grants management specialist at the Environmental Protection Agency. Her father has every confidence in her. “I admire my daughter’s commitment to excellence and achievement while remaining grounded in family, helping others, and being a nice person,” he said. The Trachtenberg School is honored to count the father-daughter duo of Joseph and Joselynn among its students and alumni.